Inside Mox II, Alejandro Moreno-Ramos tackles the subjects of slavelance translators, the dangerous threat of Gurgle translate, less-than-honest colleagues, and much more. This book includes 205 comic strips, more than half of which have never been published before, twelve articles written by distinguished translators and interpreters well known in the industry and some bonus material such as a guide to starting your own webcomic, plus step-by-step instructions for drawing Mox. 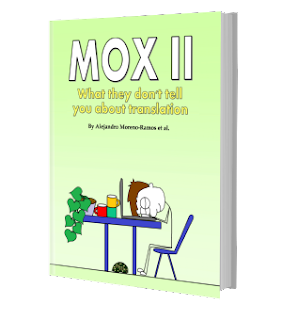 Since 2009, the very popular Mox cartoons have provided some much needed laughter to myriads of translators and interpreters, capturing the microcosm of translation through the eyes of the characters, with true-to-life representations of how they view the world. - This book simply belongs on every translator’s bookshelf. Full review by Herman Boel.